Here is a mushroom that practically every field guide will list as not edible. That it is "too tough". This is the only wild mushroom I eat in a raw state. Not all the time of course but pretty regularly. I use it like I do a piece of gum when I find it. I choose one entire shelf from the bunch that I pick, clean it as best as possible and chow down. While walking about searching for other munchable mushrooms my mastication makes miniscule morsels. Turkey tail is a tough character with just a wee bit of taste. It takes quite a bit of chewing - a nonchalant type of chew - to get it to the point where you believe you have made some headway. About a half hour later the piece in my mouth starts to actually break into pieces. Eventually there is a wad of little pieces in my mouth similar to chewing tobacco, I suppose, and if everything feels just right inside the mouth, I can manage a gulp. It's like having that occasional tougher piece of meat in your mouth that is troublesome to get down no matter how long you chew it. You have to get it just right in the mouth to make that gulp. Chewed up Turkey Tail can be like that. If it is not so tasty and it is difficult to chew then why do it? I do it because it's a very healthful thing to do, it's not disagreeable, I actually like the taste and it has become habit over the years. I pick these Turkey Tails for making broth ( for various soups and stews ) and for a medicinal tea, both of which are tasty and very good for my aging body. 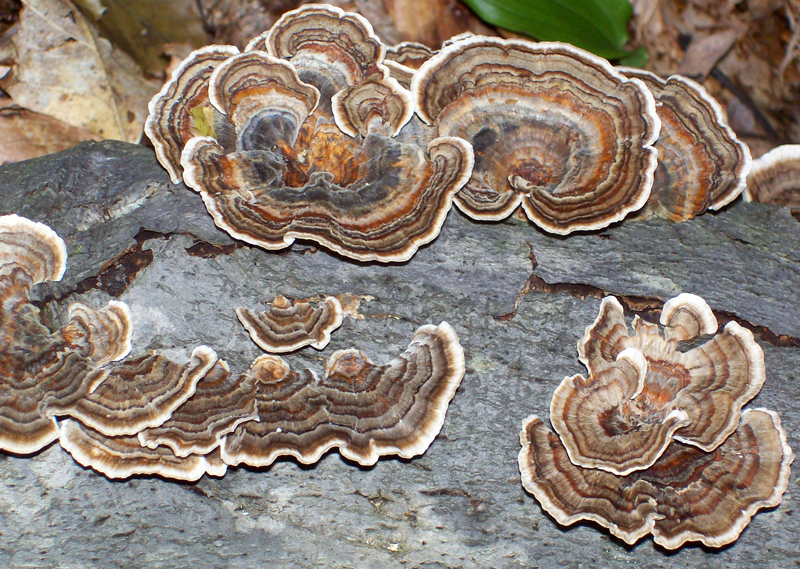 Do a Google search for Trametes versicolor or Coriolus versicolor and read. You will be doing it too. Turkey Tails are pretty easy to find. They are practically everywhere in the woods. However, finding nice sized, clean, fresh, consumable Turkey Tails is NOT that easy. Take my word for it. In my area, southwest Pa., if you are just walking about in the woods and not actually picking these to take home you'll be fooled into thinking you could fill bags real quick. there are some that grow in areas where you don't want to collect them like along paths where people walk their dogs or ride horses, etc., etc. Finally, and what happens more than you think, is that once you get close enough to make the critical identification you will discover that what looked like Turkey Tails from afar are different mushrooms altogether because there are several similar looking mushrooms that will draw you near only to dissapoint. New ones grow fresh every year - where the habitat is right. With all those factors listed above you will think they are everywhere - which they are - but just not all pickable. In spite of them being ubiquitous I have been skunked on occasion when I actually went out to find just them, especially in new localities. I usually find them when looking for various other edible mushrooms in late summer and early fall. You will find them growing on dead tree trunks and branches, whether standing or down. On a downed beech tree laying across a creek. On a standing, but dead part, of an ironwood tree. 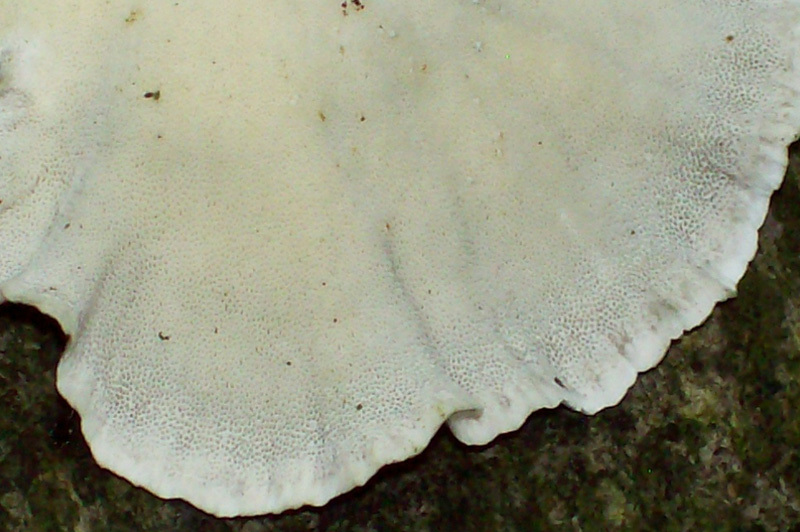 Trametes versicolor is a polypore. 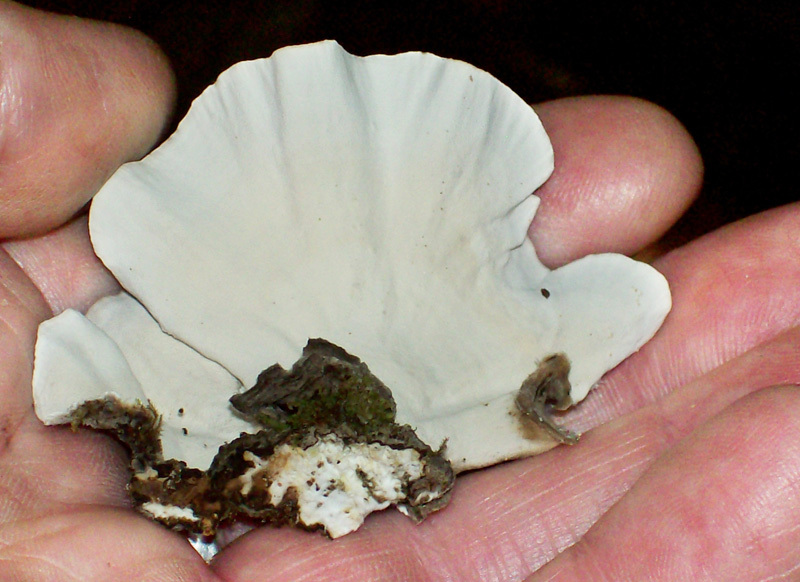 The spore bearing surface underneath will have thousands of pores. 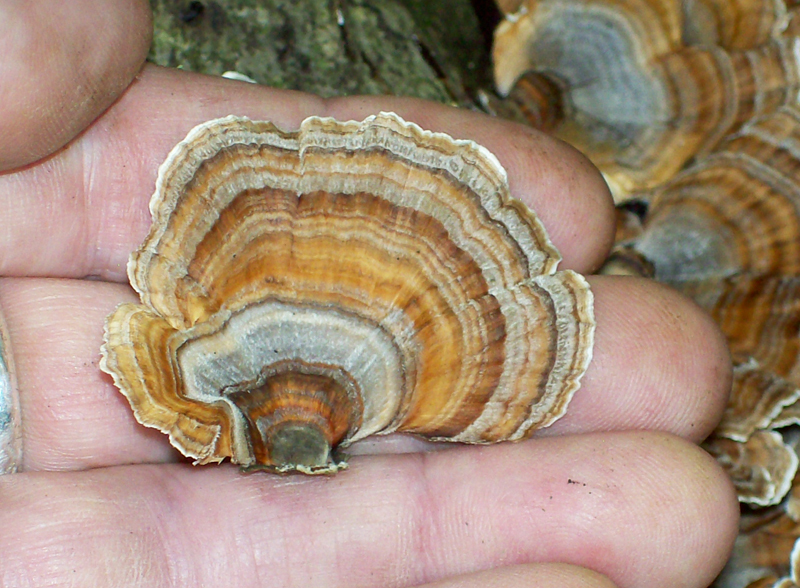 Turkey Tail pores are clean and white and do not change color when roughly handled. White pore surface. Very small pores. The upper surface is a bit hairy / fuzzy. These mushrooms are thin ( can get as thick as a credit card ) and do not get very big. About normal size is a couple of inches - like the photo above of my holding one or displaying a little bracket like in the photo below. There are obvious zones of color hues which most often are a shade of some brown or gray. Sometimes, depending on the angle you hold it, the sunlight can cause some iridescence on the upper surface. Very flexible and very tough. 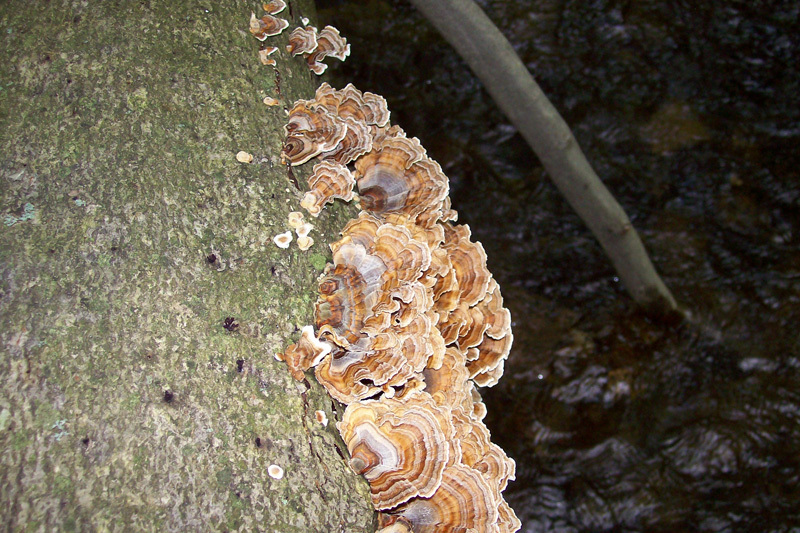 Turkey Tails can grow on the side, end or top of a log. If on the side or end the growth shape will be shelf-like, in tiers. If on top of the log the growth can be in the form of a rosette. Rosette and shelf type growth forms on top of the tree trunk. 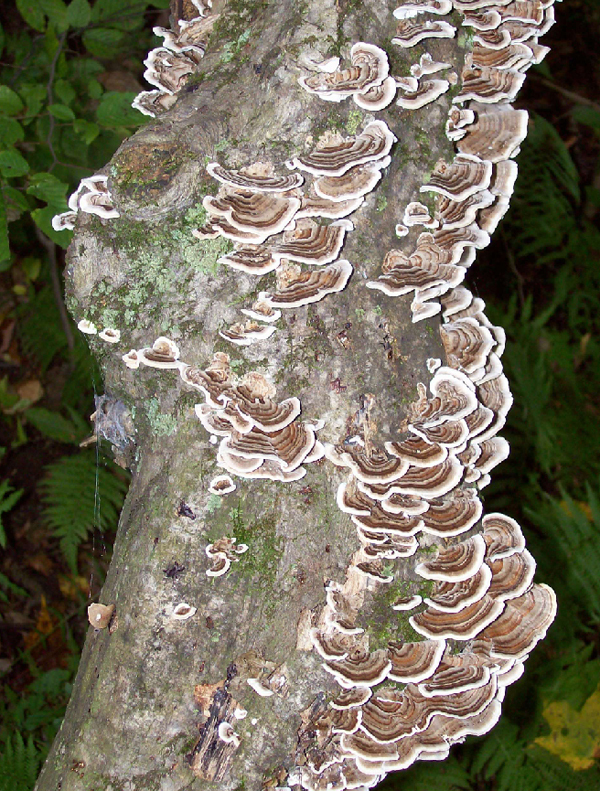 There has been extensive research of Turkey Tail mushrooms over the last few decades because of their history of use for cancer treatment in China and Japan. This research has confirmed that the extracts from these mushrooms contain polysaccharide - K ( PSK - Krestin ® ) and polysaccharide peptide ( PSP ), which are polysaccharides that help the body's immune system produce an enhanced defense against various cancers such as gastric, esophageal, colorectal, breast, lung and prostate. In addition, the extracts have been shown to rejuvenate a compromised immune system. There's much, much more good news. Too much for just a couple of pages. With all these good things being discovered there has also been a discovery that there are virtually no bad side effects from extended use. These conclusions of course pertain to concentrated extracts so any good benefits - or any side effects - will be greatly diminished by virtue of using just broth or tea. So the way I reasoned it out is that I might as well use what I can whenever possible. I am getting old and can use all the help I can get. They clean up really easy and dehydrate fast. 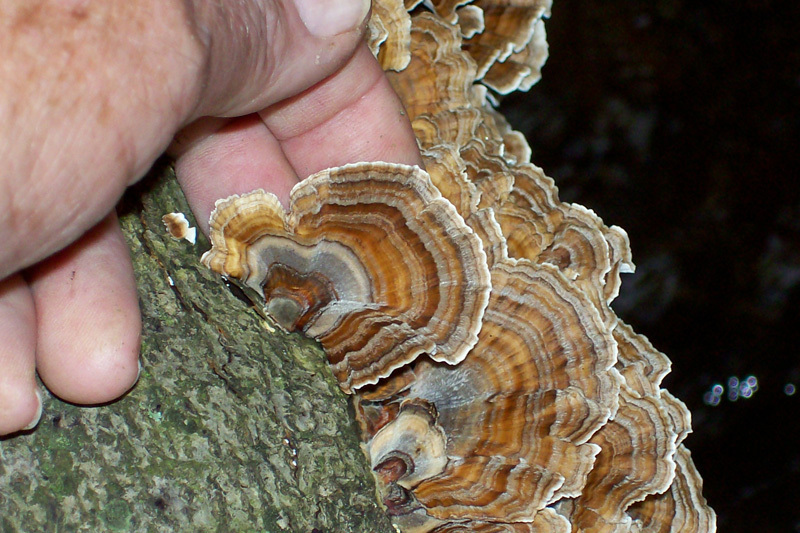 As noted above, there are other mushrooms that can have a Turkey Tail appearance - from the top - but you need to check the bottom also. Pore surface is white and does not discolor when molested. Trametes versicolor / Coriolus versicolor / Polyporus versicolor. Turkey Tail. Yun zhi. FOUND - In the Laurel mountains of Westmoreland County and Somerset County. Look for these practically anywhere that has lots of older trees - since there will be more downed limbs and trees. Another good place to find these are places that have been logged and a lot of the limb debris was left to lay there.